A talented artist (Hugh Griffith) has become rich forging paintings he alleges to be by renowned masters. 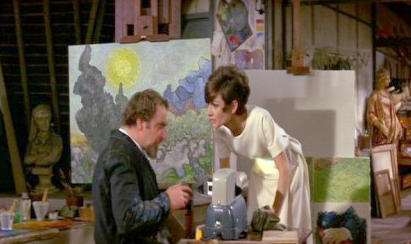 He sells only to the rich, so he laughs off the concerns of his daughter (Audrey Hepburn). When he loans a statue, alleged to be by Cellini, to a museum, however, her worries become real: a simple test, required by insurance, will reveal the statue to be a fake. 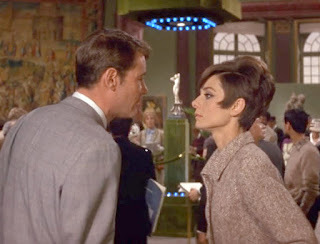 Hepburn sees an escape for her father’s impending imprisonment when she catches a burglar (Peter O’Toole) in her house: she asks him to steal her father’s statue from the museum. Escapist and fun, How to Steal a Million relies on the chemistry of the two stars to carry it, and they don’t disappoint. 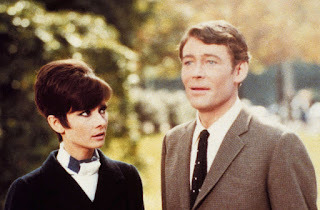 That’s not to claim that another pair would not have succeeded as well as Hepburn and O’Toole; the claim is that as decent as the script is, and as capable as the direction, it is the interaction between the main characters that makes the movie. I am one of those viewers who thinks Hepburn adds class to any film she is in. Her role as the caring daughter and intelligent working girl (though we never learn exactly what her job is) is undemanding, and something she could have done in her sleep. O’Toole, in one of his rare comedies, is suitably suave but periodically bemused by Hepburn and unnerved by his attraction for her. He gently slips into the spirit of the story; there is none of the intensity he demonstrates in other roles. Griffith is excellent as the painter who has been having the time of his life forging masterpieces, enjoying the resulting wealth but energised simply by creating what others could have. Eli Wallach, like O’Toole, usually to be found in tougher parts, has a good role, but not really a necessary one. His character is a rather nice man, an industrialist obsessed with the ‘Cellini’ statue, and enamoured of Hepburn. The script, as mentioned, is decent. There are some good lines (“You don’t think I’d steal anything that didn’t belong to me, do you?”) and the story provides a simple heist scheme dressed up with some complications. There are no surprises. The direction by Wyler, the artist who directed many great films, doesn’t break new ground, and was probably easily achieved. From the review so far, it may seem that How to Steal a Million is damned with faint praise. On the contrary, it is something that is rare: a light, fun, romantic adventure film, offering nothing much more than a couple of hours of enjoyable movie-watching. Envelopes were not pushed, boundaries were not tested, innovation was not created – thank goodness. What we have instead are two unique actors – real stars – directed by a master craftsman and working with capable supporting players, on attractive sets, likely having as good a time making the movie as we have in watching it. 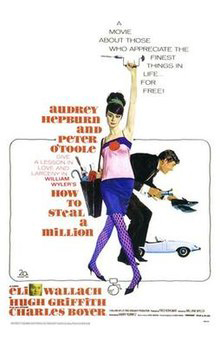 If I see other films as fun as How to Steal a Million, I would be surprised, but pleased. Filmmakers too often forget that movies are supposed to be ENTERTAINING. I haven't seen this film (I will, if I can find it online,) but it reminds me of a terrific "Midsomer Murders" episode,"The Black Book." I'm guessing this movie inspired the MM producers! Some movies seem to be made for the same reason that modern architecture and art are made - so that the creators' colleagues can be impressed. This film inspired tv commercials and other films, so I wouldn't be surprised if it was borrowed by others.